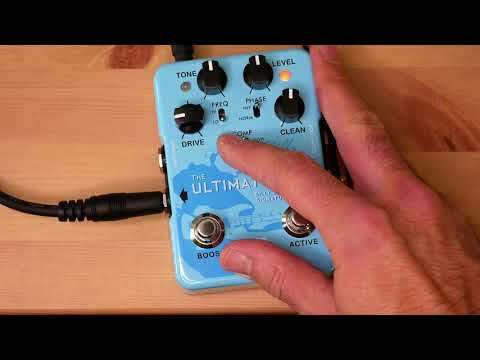 The EBS Billy Sheehan Ultimate Signature Bass Drive pedal. FREE shipping in the USA! When Billy Sheehan first turned to EBS to create his signature pedal, he needed to capture the essence of his sound in a pedal to serve him when he could not bring his entire rig. It turned out so great that it has been a significant part of his main setup ever since and served thousands of other bass players as well. Now it's time for the ultimate version! Since the pedal splits the signal into two parallel paths – one clean and one with distortion – it becomes as if running the sound through two different bass rigs at the same time. The two Clean and Drive Level controls decides how you set the mix and melt the paths together. For a tighter, more defined sound you can engage the built-in compressor. Threshold settings for the compressor can be adjusted inside. A Phase Inverter switch brings back more low-end to the drive channel at times. The Boost footswitch kicks up the drive gain a notch when needed. The new and major feature of the Ultimate version is the Hi or Lo Frequency Filter. This switch moves the whole frequency spectrum of the Tone filter up or down, to extend the capabilities of the pedal. The Hi setting adds a whole new palette of distortion sounds that was not possible to create with previous versions of the pedal. The individual Effect Loops for each channel can be used to color the channels individually with external effects. The Clean Loop jack can also be used as a clean input if you have a bass that features dual outputs. It sounds great if you run the lows through the Clean Loop jack while the mids/highs go through the main input, which leaves the lows untouched and only the higher frequencies treated by the drive. This version has inherited all the features from the Deluxe version (including the possibility to swap the drive chip without the need of soldering). But the palette of sounds you can create is expanded by the new Hi or Lo frequency filter to make it complete. The ultimate version also has a new slimmer design. Hi or Lo Frequency range Switch. * Features shared with both the 'purple' and 'orange' version. ** Features shared with the 'orange' version.